Available as a compact disc or cassette [$9.95 ($10.95)]. 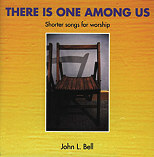 A Music Collection also available [$6.95 (list: $7.95)] as well as the one choral noted above. Please indicate your preference when ordering. If ordering the cassette, music collection or choral, the price will be adjusted upon receipt of your order but will not be shown on your program-generated receipt. If ordering more than one item, please use the text box provided on the order form. This ecumenical community of men and women was founded in Scotland in 1938--during the depths of the Great Depression and amid prospects of war. The founder, George MacLeod, was an inner city minister appalled by the lack of impact the church had on the lives of those most hard-hit by economic and political events. Today, the community is led by 200 men and women who reside mainly in Britain, but also in Africa, Australia, India, and North America. Although the community comes under the auspices of the Church of Scotland, its members are drawn from many Christian denominations, Protestant and Roman Catholic. And as with the community of Taizé, thousands journey to Iona every year for spiritual growth. Composed by John L. Bell with the help of the Wild Goose Worship Group, this music embodies the values of the Iona Community. The lyrics are immediate and relevant; the music is simple and elegant--with spare or no accompaniments. The tunes are either newly composed, based on traditional hymns and folk songs, or-in the case of Many & Great and Sent by the Lord--assembled by Iona from around the world. Each collection has been published in an American edition with new engravings (interlining all text and music) and performance suggestions for every song. Each song must pass the critical muster of the Wild Goose Worship Group before being included in a collection. The Wild Goose Worship Group--the Wild Goose is a Celtic symbol of the Holy Spirit--also serves as the performing group on all Iona recordings. And all of the recordings are faithful to the clarity, immediacy, and simplicity that are so central to the music from Iona. This is ideal congregational music.